Take a water in bowl & add 3-4 tbs salt in it,deep the fish in it for 15 min. -take another bowl & add suji,besan,garam masala,chilli powder,turmeric,salt,mix it properly. _ after 15 min remove the fish from water & slightly pres the pieces of fish for removing excess water. _ add this pieces in mixture of suji & besan.fix & spread the mixture on pieces properly by pressing it. _deep fry it in oil.spread lemon juice on it & serve. 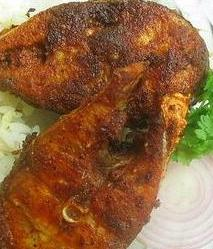 hi aarti, thanks for contributing awesome recipe,it seems very nice, i don't like fish so much but still i will try it. i hope my husband will also like it.keep uploading such nice recipes, once again thanks.